The Port of Brownsville is a deepwater seaport in Brownsville, at the southernmost tip of Texas. Opened in 1936, the port is connected to the Gulf of Mexico by a 17-mile-long ship channel. With approximately 40,000 acres, the Port of Brownsville is also the largest land- owning public port authority in the nation. 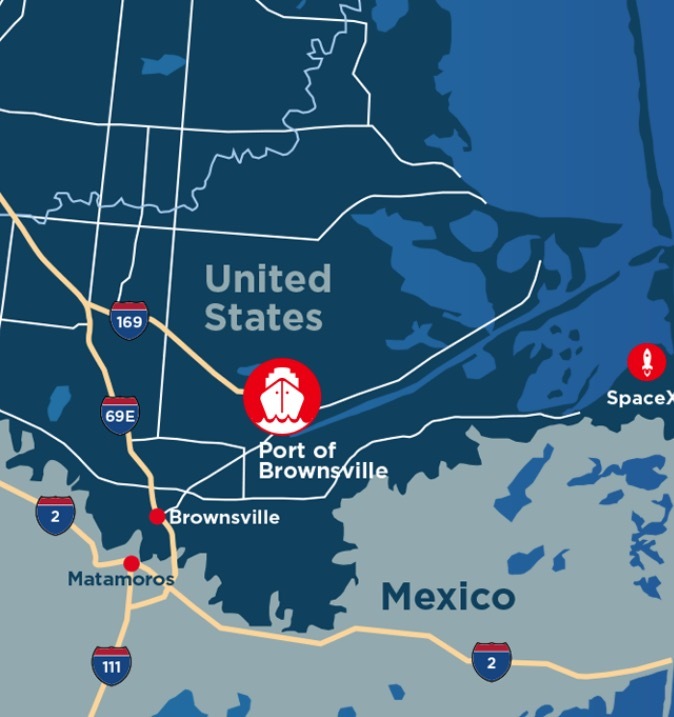 The Port of Brownsville is the only deepwater seaport directly on the US–Mexico border. The Brownsville Navigation District (BND) Board of Commissioners — the governing body for the Port of Brownsville — has signed an option agreement covering up to 800 acres of property with Big River Steel LLC enabling the steel-maker to continue its due diligence pursuant to the company’s interest in developing a LEED-certified steel manufacturing plant, storage and distribution facility. The plant would cost more than $1.6 billion to construct. “The addition of 500 new full-time local jobs, and the impact of those jobs in terms of retail spending, services, and new housing impacts represent a transforma- tional moment for Brownsville and the Valley,” Chairman Wood continued. Wood expects up to 1,500 construction workers would be needed to build the specialized steel plant. The Port of Brownsville transships more steel into Mexico than any other US port. A full house of regional stakeholders applauded Port of Brownsville officials during reports of record revenue and tonnage in 2017 at its annual State of the Port Address on 8 March. The port’s total operating revenue reached nearly $24 million in unaudited total revenue, exceeding the previous high- water mark of $19.9 million set in 2015 by more than $4 million. On the annual tonnage side of the business, the volume of cargo handled at the port topped 10.3 million short tons, also a new record. Reed cautioned the crowd of more than 230 the Port of Brownsville cannot afford to rest on its laurels and will work even harder to accelerate this momentum. “Just because we have always done things in a certain way, doesn’t mean there’s not room for improvement, aimed at advancing the everyday lives of those living in Brownsville, Cameron County and the Rio Grande Valley. And that is what we intend to,” he added. BND Commission Secretary Sergio Tito Lopez and Commissioners Carlos Masso and Ralph Cowen discussed new businesses at the port and current and future projects including channel deepening, the $1.5 billion Valley Crossing Pipeline project and the renovation and expansion of the port’s administration facilities. Foreign Trade Zone No. 62: the port’s FTZ again ranked second in the nation for the value of exports in 2016, according to the US Foreign-Trade Zones Board’s annual report to Congress. FTZ No. 62 reported more than $2.8 billion in exported goods in 2016. Additionally, it ranked 25th nationally for thevalue of imports totalling more than $2.5 billion. FTZ No. 62 consistently ranks in the top five nationally since 2012 and this marks the second time in a row it achieved the nation’s number two spot. Keppel AmFELS: Honolulu-based Pasha Hawaii announced the selection of Port of Brownsville-based Keppel AmFELS for the construction of two containerships, with an option to order two additional vessels. The contracts are worth $400 million to Keppel, creating 700 local well-paying jobs. regional collaboration: the BND signed an MOU with the Mission Economic Development Corporation to collaborate on international trade opportunities with Mexico and other development projects. This effort was subsequently followed with similar MOUs with the Cameron County Bridge System and Pharr Bridge, all promoting international economic development.